As it turns out, albeit I don’t do voice as my career focus, I decided to help out a team member and took ownership of an issue that came up. It was a phone that wasn’t working, one that was attached to an ATA 190. After I tracked down the device I typed it’s IP address into my web browser and found it in a Recovery Firmware state. What us traditional Cisco route/switch guys would consider “ROMMON” as a loose equivalent. In this case it is important to note, since the device wasn’t function on proper firmware and was in recovery mode, the IP address of the ATA is actually in the Data VLAN at this point, NOT the Voice VLAN. Well this isn’t good. My first reaction is to look at what firmware the functioning ones are on and log into CCO to download the firmware. While that’s happening I think to myself…MATT!!! You don’t know this stuff…So I do some digging. Turns out, the ATA in firmware recovery won’t accept the .bin.sgn file. I perused some forums and found that you need to download the zip and do some hex editing. It wasn’t the clearest post in the world but I figured it out and thought I’d screenshot and share it with you all. Step 1: Download .zip file from CCO correlating to the appropriate firmware. On Mac this file automagically unzips once it reaches my downloads folder however, you may have to unzip it. Once it’s unzipped we are going to open the file with a hex editor. I quickly downloaded Hex Fiend for the job on my laptop which brings us to the next step. Step 2: Open the *.bin.sgn file in your hex editor. Step 3: Now we get to edit this lovely little file in our hex editor. To do so we are going to search for the string 00 0d 0d 0d. Step 4: Select everything from the beginning of the file and mash that delete key! Step 5: Verify that the characters just after 00 0d 0d 0d are now at the beginning of the file. Step 7: Return to the ATA’s webpage and upload the newly created file and hit Start on the upgrade. 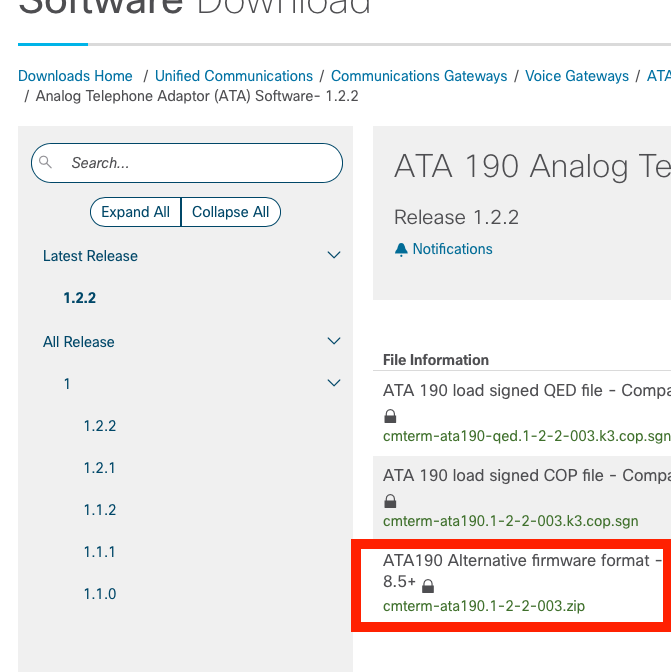 The ATA should bounce and reboot onto the newly uploaded firmware and should now successfully be in the voice subnet. Note, if you perform this to a different version that CUCM is expecting the device may take quite some time (as I’ve noticed with these 190s) to “upgrade” before it will register. Do yourself a favor, turn on logging in the ATA, monitor the files being download, and do not bounce the device. There isn’t much of a status indicator to tell you it’s upgraded except watching the logs at debug level.